Picky eaters, food aversions and swallowing issues are not uncommon and can lead to stressful mealtimes and nutritional issues. Sensational Kids runs a feeding program based on the SOS Feeding method – a fun and step-by-step approach suitable for even the youngest toddler. 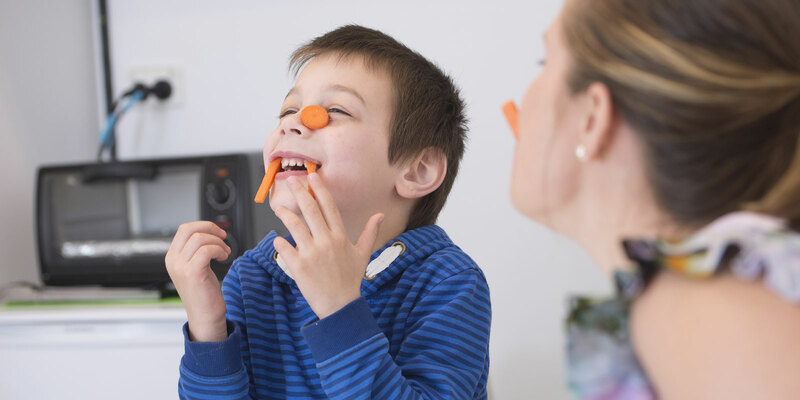 The program focuses on helping kids become comfortable with trying new and different foods through creative play and conversation, thus reducing the stress commonly seen during mealtimes. WOULD MY CHILD BENEFIT FROM ATTENDING FEEDING THERAPY? WHY DO SOME CHILDREN HAVE DIFFICULTY EATING? There are many potential reasons why a child may have difficulty eating, or restricted food intake. For some children this may be due to swallowing difficulties from birth, or other medical conditions that impact on the muscle or nerve functions. For others, there may be a sensory sensitivity, anxiety due to a past choking experience or learned behaviours. Whatever the reason, the Sensational Kids Feeding Clinic is able help kids work through these challenges and improve mealtime enjoyment and safety. Our skilled therapy team uses the SOS Feeding program to help children explore food and gradually increase their confidence with trying new foods and textures. Sessions will be held with one of our trained Speech Therapists or Occupational Therapists. They will start by looking at any past and current concerns or behaviours and then help set some realistic goals with you and your child. All sessions are planned around individual children’s goals. For some, that may be trying a wider range of coloured vegetables, meats or attempting varied textures. For others, it may just be to tolerate having a certain type of food in the same room, or on the table in front of them. Parents are usually involved in the session so that the therapist is able to model for you and teach the skills needed to carry through to mealtimes at home. The sessions are often messy and fun, with interesting actions or reactions. More often that not this includes children trying – and enjoying – something they have previously rejected. The sessions are very step-wise and progressive, allowing children to feel comfortable with each new texture and taste before moving onto the next. The program is offered in blocks of 10 treatment sessions. Some children progress well in the first block and don’t require further treatment. Other children may require more than one block of treatment. Sessions are held weekly and it is important that you are able to commit for the whole treatment block for optimal outcomes. HOW DO I BOOK INTO THE FEEDING CLINIC? Give us a call to see one of our Feeding Clinic clinicians. Our admin team will be able to provide further information if required and will be able to organise a time for you.